Your participation in Team Wright-Way will help us continue to reduce the number of homeless, adoptable pets that are euthanized in the Midwest each year and save even more animals than before. We can’t do it without YOU! We hope you will join us to run for Wright-Way Rescue in 2019's Bank of America Chicago Marathon. Wright-Way Rescue is now accepting applicants to Team Wright-Way for the Bank of America Chicago Marathon. Save the lives of homeless animals with your fundraising. Join 10,000 other charity runners, who all want to make a difference. Be supported by 1.7 million spectators through 29 Chicago neighborhoods on 2018 marathon day. Be provided with your own online fundraising page to help track your goals. Receive incentives and support as you prepare for your ultimate goal. We are your cheerleaders! 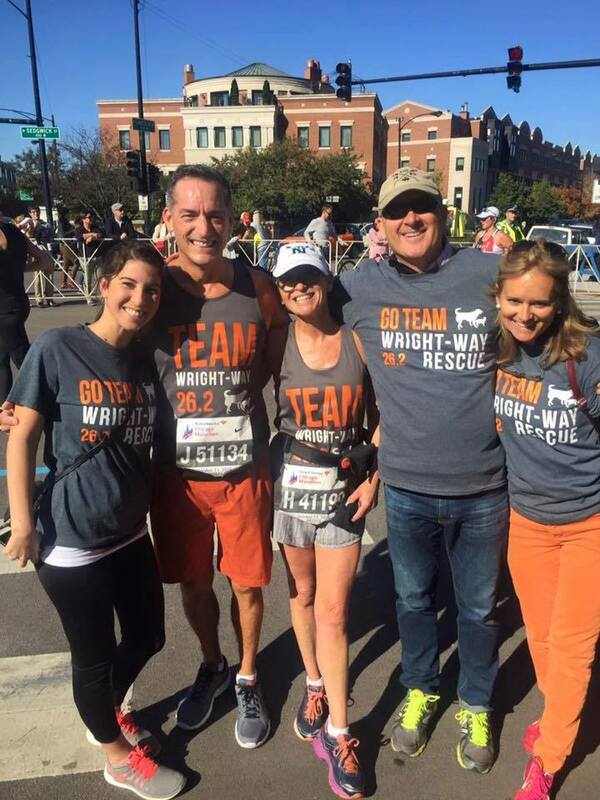 Runners who wish to bypass the drawing and secure a guaranteed entry into the Chicago Marathon may apply to join Team Wright-Way. As a Wright-Way team member, your entry fee of $205 will be waived if you meet your fundraising minimum by race day (if requested). Accepted runners must commit to a fundraising minimum of $1,250 for Wright-Way Rescue. If the minimum is not met one month after race day, the runner will be responsible for the remainder. All guaranteed entries will receive their own personal fundraising page through Crowdrise. Runners are responsible for securing their own entry by following the Bank of America Chicago Marathon guidelines. Once it is open, you can enter the drawing registration on their website. Wright-Way Rescue will accept all team members after they receive a secured spot through the drawing. All Team Wright-Way members will have their own personal fundraising page through Crowdrise.com.